I’ve been speaking with a variety of researchers on the legal aspects around our digital accounts and what happens to them after we die. Often the discussion focuses on who is entitled to access a deceased person’s online account data – such as email, photos or documents – and the consensus is that it’s complicated. Some platforms such as Google have started to allow users to nominate next of kin, family or friends to receive their personal information once their account becomes inactive. With the Uniform Fiduciary Access to Digital Assets Act approved in the US (July 2014), we may see a system where a personal representative of a deceased person’s estate has as much right to manage the digital assets of the deceased in the same way they would their tangible assets. 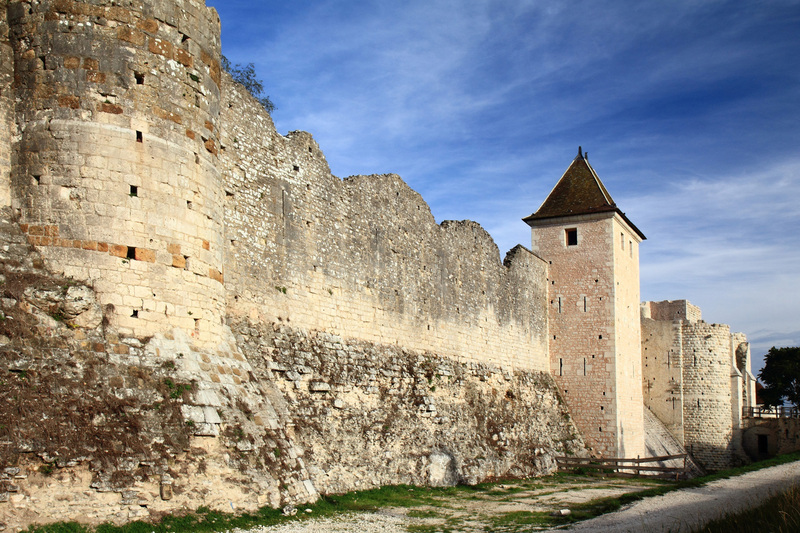 Currently ownership of digital assets often remain with online services such as Facebook and Yahoo unless contested through the legal system by a next of kin. While laws are catching up with digital and social technologies, Damian McCallig, a PhD candidate from the School of Law at National University of Ireland in Galway is curious to know what will happen to our data a generation or more after we die. As he points out, current copyright laws in countries like the UK and Australia allow someone’s personal information to become available in the public domain several years after that individual has died. Records around births, deaths and marriages are accessible by researchers or family members interested in their genealogy or a previous generation’s history. Unpublished works such as diaries or letters can be published without the permission of their estate, as long as a certain period of time has passed since the author died. In the UK, this is seventy years, although there are specific exemptions. McCallig believes that Facebook would have been alerted to the opportunity around its memorialised accounts (what is Facebook memorialisation?) when a father campaigned for a ‘look back’ video to be made for his son who died in 2012, attracting widespread support. He wonders if Facebook is assessing the commercial potential for its deceased accounts in the long term. Facebook’s main revenue stream comes from advertising, based on driving eyeballs to ad creative and sponsored posts. Memorialised Facebook accounts offer no value to marketers or monetisation options for the company in its current model. While he’s not certain on how Facebook would commercialise these accounts, likely scenarios could include charging researchers, educational institutions, public information bodies and even individuals for access to archival information. If this is the case, should these historical insights and archives be available freely to the public or remain in the hands of commercial companies? And if Facebook fails to survive, should there be a contingency plan to protect and share our histories with future generations? Read more about Damian McCallig’s perspectives on Digital Remains or connect with him on Twitter. A legal representative such as a solicitor or lawyer can act as a third party confidant in helping you plan a digital afterlife and privately keep your passwords on file for next of kin. There is also an increasing number of digital afterlife and secure online password services that will help you assign important information such as bank or legal documents to nominated beneficiaries as well as release usernames and passwords according to your instructions. These can be more convenient for people who are active internet users changing passwords several times a year across multiple accounts. They allow users to automatically access and update their information whenever they want without the need to work through another person. This is useful if someone has to respond quickly to a bug or security threat. There are other advantages too. Online services concerned with passwords and passing on digital legacies are varied in what they offer but generally speaking, they aim to centrally manage multiple sources of data in one place. Many include a decent amount of storage for the account holder to organise photos, memories, notes and documents with friendly user interfaces for viewing and downloading. On the whole, they encourage users to think in a structured way about doing an inventory of their online life and the digital legacy that they’d like to share. When doing your research, it’s worth fully understanding how the service will verify when it is time to share your confidential information. Because of their nature, digital afterlife services are often automated and take a variety of approaches to ascertain if someone has died and if their data should be passed on. Some such as Google Inactive Manager provide information to next of or nominated kin if the account holder hasn’t logged into the service for a period of time. Others, will send prompts, such as emails or texts to customers periodically, asking them to confirm that they are still alive. If there’s no reply, these companies will often do additional checks to establish if the account holder is deceased before finally distributing information to next of kin. If you don’t check in with or respond to this kind of service within your agreed time period, you may end up sharing information before it’s time, something that will be distressing, awkward and have security implications for you. Ensure that you fully understand the terms and conditions as well as the style and format of communication this kind of service has – both with you and your next of kin. Also, make sure that your digital service fits in with your lifestyle. If you are not likely to check in regularly with a service that relies on you to do so, either because you don’t spend a lot of time online or you’re unlikely to remember, this type of offering won’t be a convenient option. Similarly, a digital legacy plan that operates by sending a series of electronic prompts asking you to confirm that you are alive won’t work for you if this type of communication bugs you. Given that the digital afterlife industry is still an immature one, I’d recommend that you find out what the financial status or longer term vision is of the organisation that you’re considering. There have been a few mergers of late. 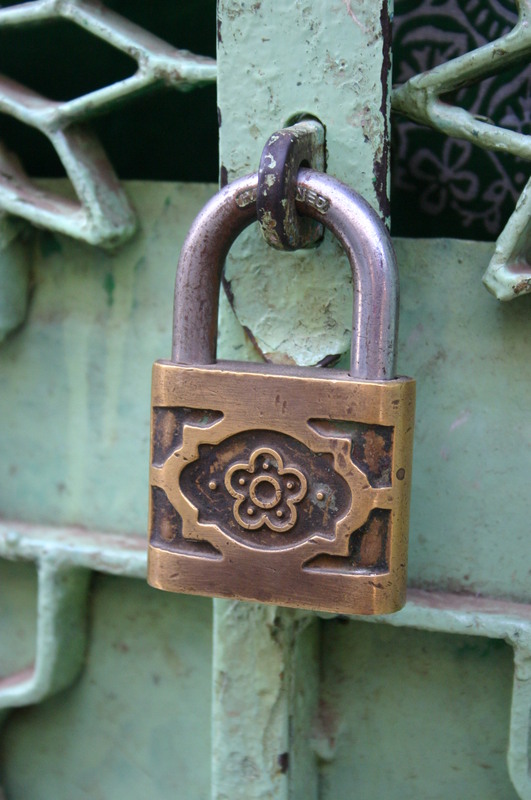 Entrustet was acquired by SecureSafe and more recently PasswordBox bought LegacyLocker. Shifts happen in any industry but it’s worth asking any potential company that’s going to be charged with your digital legacy, what its longer term goals are and how it is going to support them. What are its contingency plans for your data if it expires before you do? Finally, it’s worth re-iterating that you should check terms and conditions to fully understand what you’re subscribing to, what your responsibilities are when using the service as well as the service provider’s accountability to you. According to Damin Murdock, Principal Lawyer for MurdockCheng Legal Practice, the main benefit of storing your digital estate with a lawyer as opposed to an online platform is that the client will have the comfort of knowing a law firm has a succession plan and is bound by strict rules, regulations and statutory duties. With an online platform, you are only bound by terms and conditions of use for the online platform. Be clear what kind of jurisdictional rules may apply to you and what its commitment is to you and your data. What digital services exist to manage and transition passwords and other important documentation to next of kin? Who owns a person’s digital and online data when they die? Apple recently made national news following their misunderstanding of an estate related query from one of their customers in the UK. A son inherited his mother’s iPad device and he appealed to the manufacturer to help him unlock it. The company asked for a series of legal steps to be undertaken and documents to be provided with the request as their concern was to protect the account information, data and content of the original owner. When the company realised that the son only wanted to use the device and for it to be returned to its factory settings, that is to say, wiped clean of its previous owner’s accounts, data and history, it duly complied and fulfilled the request. 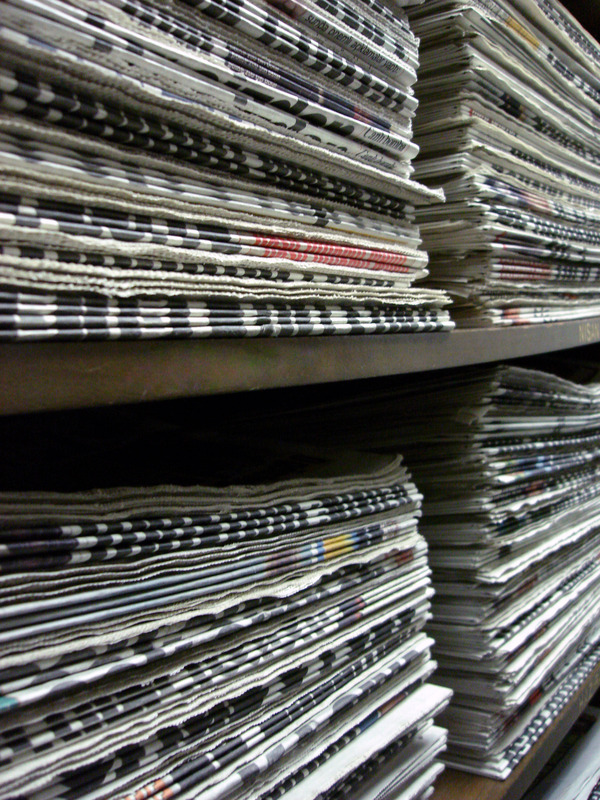 This news story highlighted that online data and accounts do not automatically have the same status as we associate with traditional or fixed assets that form part of an estate. In this case, while the iPad as a device was seen as transferable from person to person, the data and software contained within it was not and may not have been, even if wishes regarding it had been explicitly outlined in a will. Who actually owns digital assets is a key yet unclear issue in today’s estate and legacy planning. There was a hoax story a while ago in which Bruce Willis was suing Apple because he wouldn’t be able to pass his extensive iTunes collection on to his children when he died. The story was bogus but as Paul Gordon, Associate for Finlaysons, a national law firm in Australia points out, the issue is real. In a previous post, I’ve mentioned how people who have lost relatives or friends often have a drive to find out more about them, including their digital lives. While this latest case with Apple made headlines, it’s not an uncommon event. Digital providers will not just hand over access to personal data or information of the deceased unless there’s a legal requirement to do so as their position is to defend the privacy of the account holder, in death as in life. Damin Murdock, Principal Lawyer of the MurdockCheng Legal Practice based in Sydney suggests that when writing up a will, individuals remove any ambiguity about how they want their digital information dealt with upon their death. “I always recommend my clients to have a list of all bank accounts, passwords, PIN numbers and so forth with respect to financial institutions,” Murdock says. Gordon concurs and doesn’t anticipate changes in legislation to digital and online asset ownership anytime soon. He agrees that it is important to consider what will happen after you die and make sure it is well documented, ideally in a will, but also known amongst family members. Go to your Google homepage, click on your profile or avatar picture at the top right hand side of the page and select ‘Account’ after your name. You’ll need to be logged in to set up this feature. Once in your ‘Account’ page, select the ‘Data tools’ option at the top of the page and then click on ‘Set up Inactive Google Manager’. You’ll be presented with the Google Inactive Manager dashboard. Click on ‘Set up’ to get started. First you’ll need to provide a mobile phone number. Click on the ‘Add mobile phone number’. The system is intuitive so it doesn’t matter if you type in a zero after the country code or leave spaces between numbers. Once done, hit the ‘Send verification code’ button – it should send a code to your phone via SMS which consists of a series of numbers or letters and numbers. Add to the ‘Verify number’ box which appears and click ‘Confirm’. You can also add another email address to receive updates or alerts at this point. 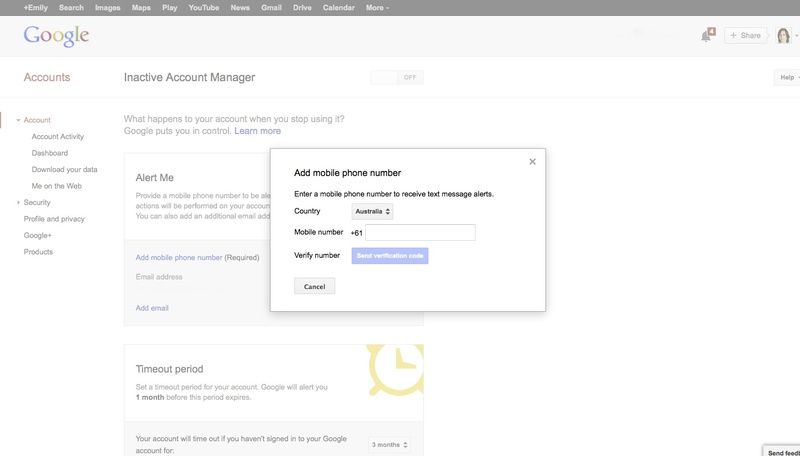 Once you’ve provided your contact details, select a timeout period on the Google Inactive Manager homepage. This means the length of time that you leave your Google account inactive, i.e. 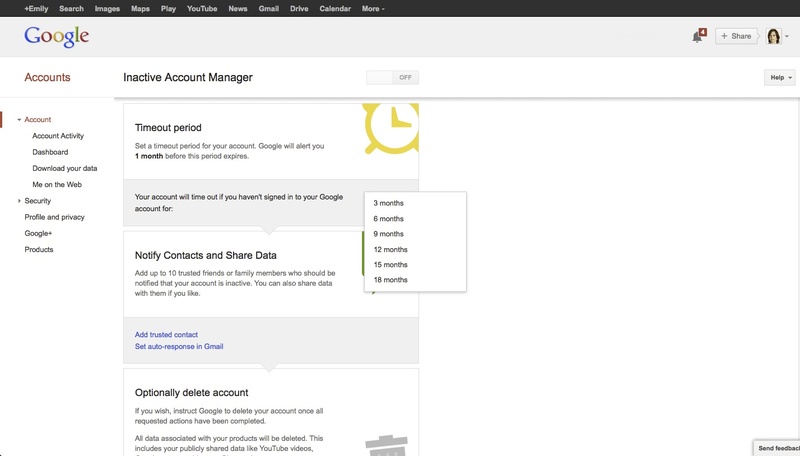 the period during which you do not log into Google for email, search, Google+, Drive or any of the Google tools. The minimum period is 3 months, the maximum period is 18 months. Think of the feature you most commonly use on Google and base a time period around that. Remember though, Google only knows that you’ve used your account if you have logged into your account. If you use Google search everyday but are not signed in then you check your email every six months which you have to sign in for, Google will register the six month email activity on your account but not the search. Next, select ‘Add trusted contact’. You can nominate up to 10 contacts who will have three months to download your data once the account is inactive. Here’s where you can enter the email details of the person(s) you nominate to receive your data. Check the ‘Share my data with this contact option’ to ensure that they are able to receive the data later. 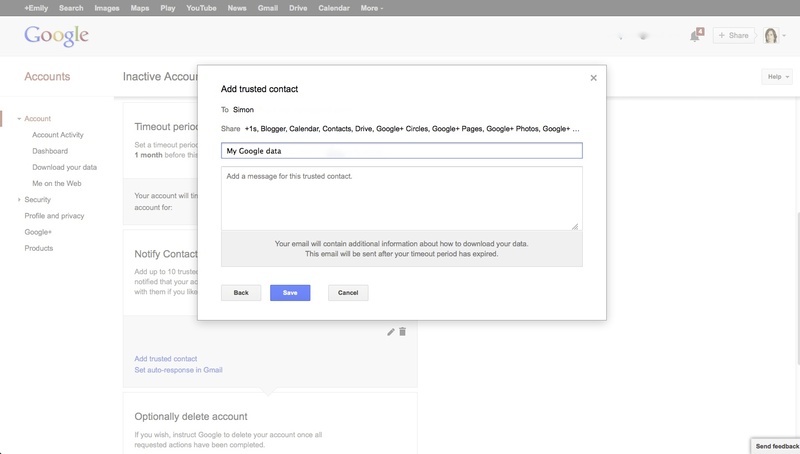 If there is someone that you don’t want to have access to your email or other Google data but would like to send them a message, you can add a note for them at this point which the recipient will receive when the timeout period has finished. Select the Google data that you would like your nominated person(s) to download. As well as making sure your contact details are correct, you’ll need to verify the correct phone number for your nominated contact(s). You’ll also need to update your contact’s mobile phone if this changes over time so that they will be able to access your account once it has become inactive. You can pick and choose what your nominated contact(s) will be able to download and access. After hitting the ‘Next’ button, you’ll be taken to a page where you can leave a message for the person you’ve nominated to receive your Google data. While setting up Google Inactive Manager is practical, the message doesn’t have to be. It’s a good opportunity to leave a thoughtful message behind for someone who is grieving. What would they want to hear? Anything you want them to know? What you say could make a difference to them. 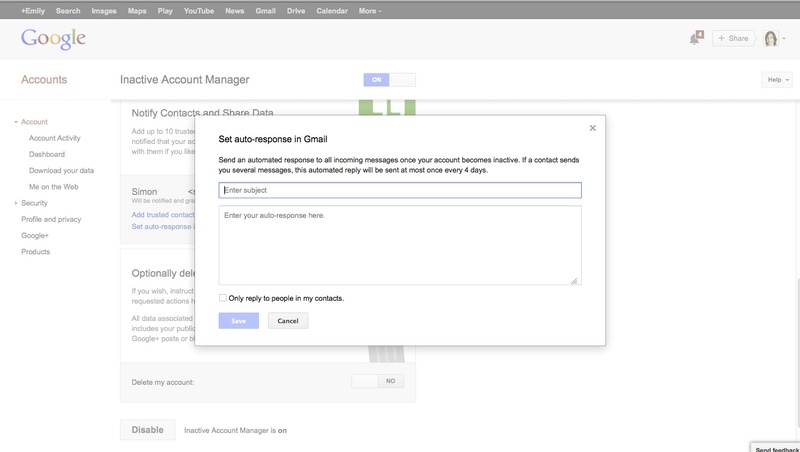 Google Inactive Manager also allows you to set up an auto-response to incoming email once your Google account has become inactive. 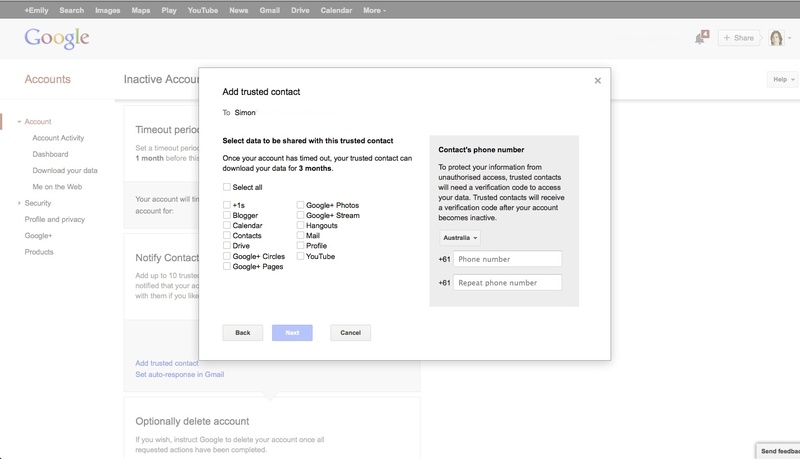 Lastly, you decide what happens to your Google account once your outlined actions have been completed. Would you like the account to be deleted? Google Inactive Manager includes this option which will also remove any public comments/data you have, for instance on YouTube or Google+. Once you’ve hit ‘Enable’, your Google settings are confirmed. Remember, you are able to update your settings at any point. 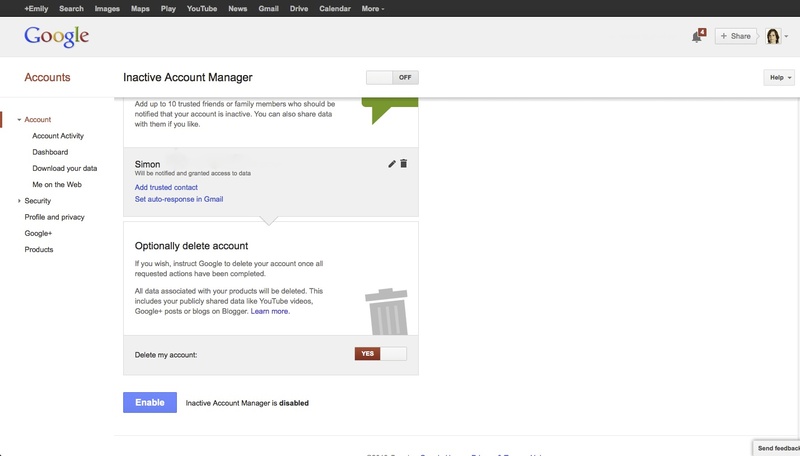 Visit this earlier post on things to consider when setting up Google Inactive Manager.